Captain Threvon Pluck receives the winning trophy from Ms. Gillian Frank in the presence of his teammates and Coach, Domini Garnett. 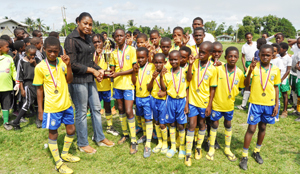 along with the top individual performers were all rewarded yesterday when the Ministry of Culture Youth and Sport/East Bank Football Under-13 League presentation took place at Grove Playfield. Grove Hi Tech emerged as champions ending unbeaten in five games with Herstelling Raiders taking the runner-up spot followed by Agricola and Kuru Kururu Warriors as third and fourth. Director of Youth within the Ministry of Culture Youth and Sports, Ms. Gillian Frank in brief remarks before presenting the prizes, congratulated the youths for their excellent performances during the tournament. Ms. Frank told the players that her ministry will continue to work in harmony with the EBFA to ensure that the development of the youths is priority, pointing out that they also sponsored a Youth Academy during the August holidays that attracted over 100 youths. The top individual performers were also complimented by Ms. Frank for their performances that saw them being rewarded. She also told the players that they are all winners. Herstelling Raiders’ Nidu Supareddy was named best goalkeeper, being beaten once by Grove in their opening game. Threvon Pluck, Captain of Grove Hi Tech who earned the most valuable player accolade also ended as the joint top leading goal scorer along with club mate, Kevin Padmore; the two ending with 5-goals each.